Glass fiber reinforced plastics (GFRPs) are one of the most widely used composite materials and hold great potential applications due to their high-performance and cost effectiveness. 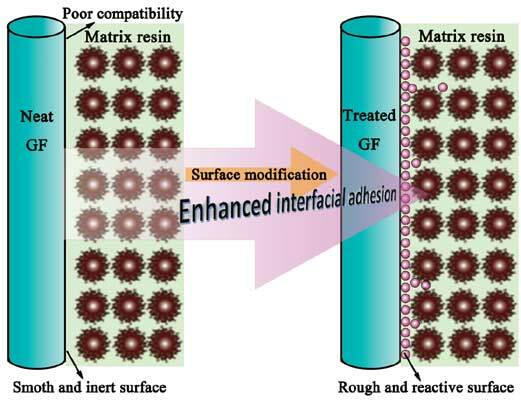 Desired interfacial adhesion are paramount important in order to achieve enhanced affinity between fiber and resin matrix, and to improve the durability of GFRPs. One solution is fibers surface modification and functionization. Commercial glass fibers are sized by sizing solutions and are drawn into filaments. In the sizing solution, coupling agent works as “bridge” to bond fiber with polymers. There is an interphase between glass fiber and resin matrix, which is critical in determining the properties of fiber reinforced plastics. The commonly used coupling agent usually only affect thermosetting plastics, but have little effects the on thermoplastics, particularly when resins have few or no polar groups. For the fiber reinforced plastics composite, limitation is that while the strength is increased, the toughness of the materials degrades. In addition, the matrix polymers are limited due to available sizing solutions for fiber surface modification. Thus, methods such as treating glass fiber by coupling agents, grafting polymer chain onto fiber surface are alternative way to improve GFRPs performance. From the perspective of organic chemistry, this review focus specifically on introducing glasspolymer matrix interphase design, glass fiber sizing, methods to improve composites performance and problems associated with it. Insights and strategies were proposed and discussed as well. Coupling agent, film former, GFRPs, grafting, interphase, sizing, surface modification. The Xinjiang Technical Institute of Physics & Chemistry, Chinese Academy of Sciences, Urumqi, Xinjiang, China 830011.